Sun Spots - ZineWiki - the history and culture of zines, independent media and the small press. 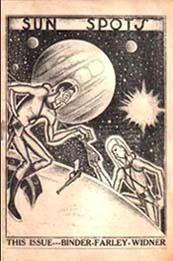 Sun Spots was a science fiction fanzine published by Gerry de la Ree, Rod Gaetz and Roy Plotkin in New Jersey, U.S.A.
29 issues of Sun Spots appeared, starting in 1939, and running until September 1947. It began as a mimeographed publication, but soon was printed. Contributors included Eando Binder, Frank T. Buchner, Charles A. Celing, Louis Russell Chauvenet, Ralph Milne Farley, Rod Gaetz, Lew Martin (The Alchemist), Dave Miller, Sam Moskowitz (Different, New Fandom), Roy Plotkin, D. B. Thompson, F. O. Tremaine, and Art Widner (FanFare). Illustrations were contributed by Harry Harrison (May-June 1941), Gerry de la Ree, and Tom Wise. Sun Spots also featured the results of the 'Beowulf Poll', in which fans ranked the works of weird fiction and science fiction writers which was conducted through Gerry de la Ree's other publication Beowulf. Gerry de la Ree also published, with Genevieve K. Stephens as co-editor, the fanzine Loki. This page was last modified on 12 October 2012, at 13:56.